Champiñones al Ajillo is a traditional tapa. Photo: Fry the mushrooms in olive oil and butter. In the skillet behind - Spanish Chorizo, also a common tapa. I suppose that no detailed explanation of how to cook it is necessary. Try it! 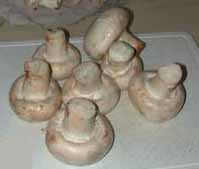 Clean and rinse the mushrooms and cut them into rather thick slices. Slice the garlic cloves or squeeze them. Bear in mind that the garlic taste gets stronger if you squeeze them. Add them to the skillet with the oil and butter. When the garlic begins to brown, add all the mushrooms at the same time. 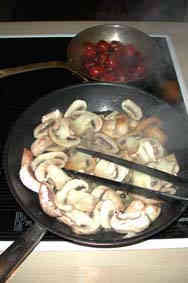 Fry until the liquid from the mushrooms disappear and they are golden brown. Put the mushrooms on a serving dish and sprinkle chopped parsley on the top.